It's a scorching hot day in central eastern Namibia. Three Nama women sit peacefully in the sparing midday shade of a gnarled acacia tree. Their heads turn right toward a curious arrangement of approaching sounds. Grinding metal and sand, rattling plastics, heavy breathing. The source of these sounds is just as curious as the noise itself. Two figures bump along the rough road on matching bicycles. Their rims are covered in dust, tires sending pebbles flying. Their faces are red. Their shirts are streaked with the salty residue of sweat. Their heads are down. They are singularly focused on a point ahead, not far now. The women under the tree watch the slow, pathetic progress of these travelers. Their gaze shifts left as they pass. The cyclists are stuck in the sand, deep sand, and this is where they should dismount and push their bicycles on through. But the cyclists remain seated. They lean forward and gnash the pedals through the muck. Their destination is just meters away, and they're determined to reach it with gears spinning. A front tire lifts out of the sand, finally finding purchase on the terra firms of black tar. Another tire climbs onto the pavement. The people under the tree watch the people on the bicycles cross from gravel to asphalt, from rough to smooth, from a month of arduous, self-inflicted slogging through the sand to a coming month of pleasant coasting along the bitumen. There aren't any celebratory shouts or great expressions of joy. Just a long, barely audible exhalation from the mouths of each of these travelers, a shared sigh of relief. A subsequent inhale of reprieve. Chains click mechanically into higher gears, and the beleaguered bikers race silently along this dark ribbon of road toward the town in the distance. We ride north for a week. Through Stampriet, through Leonardville, along the C15, the M42, the C20. The roads are not especially bad, though not especially good either, and we make peace with fifty-kilometer days for most of the 330-kilometer stretch. Parts are sandy and other parts are just fine. The scenery is a tad greener. The trees a bit more abundant. But largely it's more of the same. Mechanical issues arise. On our first day since leaving Gochas, Lauren's shifter cable snaps. Her rear derailleur sits stubbornly in its highest gear and the clicking of her bar-end shifter will do nothing to move it. It's mid-afternoon, and the hills ahead tough but manageable with just the three chainrings controlled by the (still-working) front derailleur. We resolve to carry on and attempt a fix at camp this evening. Thankfully, we've brought spare cable. Alas, we haven't brought the knowledge to install new cable. A snapped cable is one of those things we didn't really expect to have happen. In a collective decade of riding bikes, neither of us ever snapped one. If catastrophe struck, we assumed we'd either ride with just the working derailleur (each bike has two), or learn how to swap cables on the spot. Elsewhere, we discover our handlebar baskets are breaking apart. After weeks of violent crashing against hard, corrugated roads, the lattice-work of aluminum has begun to crack and separate from the mounting plates that connect our baskets to our handlebars. This is a structural problem that'll require some welding, or deliberate shopping in a bountiful hardware store, to fix. We buy ourselves some time by bracing the baskets to the mounts with cable ties. Our gear has been put through a lot. Most of it is holding up well, but some has had enough of these conditions. A buckle on one of Lauren's panniers breaks. Her sleeping pad develops an undetectable slow leak. Our clothes are torn in places, stained in others. I get a flat tire. The desert quickly becomes the bush, and camping and cooking become more of a challenge. Tall grasses make finding a spot difficult. We tread carefully through thick brush, looking out for snakes and sharp, tire-puncturing thorns. We give up on level ground and settle for sleeping on lumps. We cook cautiously, aware just how quickly everything around us can be set ablaze. When we emerge onto the road each morning, everything we own is stuck through with bristles and burrs. While camping, we hear baboons. We see them one day, dozens crossing the road toward an abandoned building of crumbling clay. We're passed by warthogs and springbok and plenty of donkeys and horses. We pass hundreds of termite mounds, a meter or higher, devouring the landscape. And we pass farms. Farmers. Farmers in trucks speeding by and inadvertently kicking up dust and gravel for us to choke on. Eventually, we reach Gobabis. We pedal past the women under the tree and up onto the tar and into the biggest town we've seen since Clanwilliam, since those gravel roads began in the mountains of South Africa. We zip through the crowded streets, past the commotion of semi-urban living. It's a shock to the senses, the hustle and bustle of this small place. Our first stop in Gobabis is Wimpy. Most of the very few meals we've eaten out have been at Wimpy franchises throughout southern Africa, fast food diners sharing walls and floors with petrol station convenience stores. Thirsty, hungry, and hot, we blow our daily budget on fries, sandwiches, and "mega"-sized shakes. We connect to the internet and message Desmond, who has kindly agreed to put us up for a night. He's the first Couchsurfing host on our route since basically Cape Town, and we're thrilled to have some human connection. We're given coordinates to his house, in a township just a few kilometers from Wimpy. Desmond's still at work, he tells us, but his mother and nephew are home and we're welcome to head over and settle in. We meet Lidia, Vandro, and Rocky, their gargantuan canine, at the gate. Lidia leads us around the house, urging us to make ourselves at home. She shows where we'll be sleeping, a spacious bedroom with an actual bed. After we take showers, Lidia helps us heave our dusty clothing into an actual washing machine. This shower is our first in days. This bed is our first in two weeks. This laundry, it features our first proper spin cycle since leaving home. We do little the rest of the day. We watch television and relax. 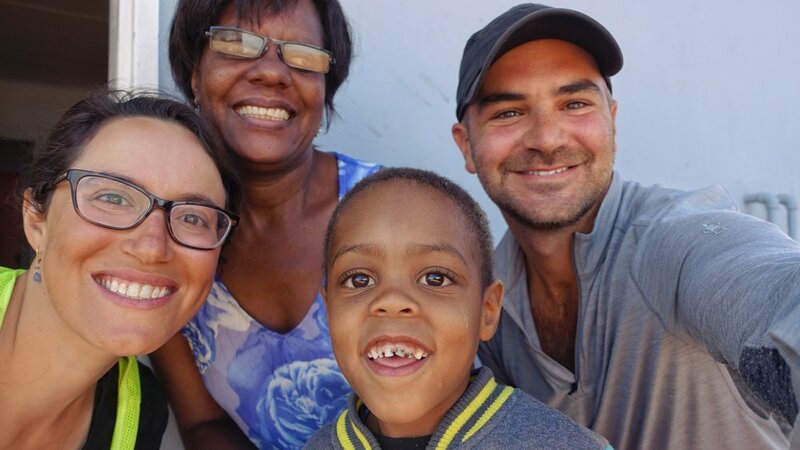 We stopped at the market before reaching the house and loaded up on heaps of groceries, so we offer to make dinner for Lidia, Vandro, and Desmond, who's on his way home. Desmond arrives to a pair of strangers huddled over his stove, the kitchen steaming and smoking with the smell of charred broccoli. It's a simple meal, broccoli stirfry and spaghetti, but we've picked up some new seasonings and we've made bunches and we're just thrilled to be cooking it standing over a kitchen counter, heating food in pots large enough to prepare adult-sized portions. We greet our gracious host, tell him to help himself to the food and some wine from a bottle we've just opened, and the three of us head into the dining area to talk and eat. We watch some more television after dinner. But we're exhausted, stuck on the heliocentric schedule of extended camping. Most days, we wake at five or six and fall asleep by 7PM. This makes evening socializing, in the rare instances we get the opportunity, difficult to remain awake for. We'd only arranged to stay with Desmond for one night. We could use a rest day, and figure we'll just find a place in town for the following evening. But before we go to bed our host kindly asks if we'd want to stick around tomorrow. We'd be more than welcome, he tells us. We sleep in. Desmond is already at work by the time we start moving about, but Lidia is home and helps us navigate the kitchen in preparing our breakfast. Later, we walk back to Wimpy to use the internet. We get another round of shakes, some fries, and pick up a few more groceries across the street. For the second night in a row, we cook spaghetti and broccoli for us and our hosts, this time with white wine instead of red. If they're underwhelmed, they certainly don't show it. They thank us tremendously for the meal. We watch a movie. We head to bed. And the next morning, after expressing our gratitude to the family for a lovely, relaxing stay, we depart for Botswana. Our bicycle ride is thrilling. We're on a tar road with only the slightest of inclines, a tailwind at our backs. Not since leaving the Cape has our cycling been this easy. We're moving at least three times as fast as we have through most of Namibia. Within the first hour or so, we travel thirty kilometers. For us, this is unbelievable. The return to paved roads is wonderful. It brings joy back into pedaling. But it brings danger, too. Across nearly a thousand kilometers of gravel since South Africa, we've enjoyed wide open roadways, often devoid of cars and people for hours at a time. It has been perfectly safe to stop in the middle of the road, ride on the right when the left is no good, cycle side by side with only the most passing concern for traffic. We are now on a main thoroughfare, and things are different. There is one lane of eastbound traffic and one lane of westbound traffic. The road is narrow. We do our best to ride in the shoulder, which is even narrower. At times it is nonexistent. We need to remain alert. Drivers zoom past us at well over a hundred kilometers per hour. They do not slow down when they pass. We're hardly ten kilometers into our ride when a white sedan emerges from behind a large oncoming truck. The sedan pulls into our lane, aiming to pass the truck. We are in this lane, so at the moment a passing maneuver is not possible. We assume the driver in the white sedan recognizes this. But apparently he does not. He picks up speed, roaring toward us. With no shoulder to bail into, we swing into the far left of the lane at the last moment. He races on, very narrowly missing us. He beeps his horn. The trucker blares his in return. We shout profanities at the former, but of course he doesn't hear us. We turn back and he has passed the truck, now back in his own lane and speeding far down the road, unfazed. And so we remain vigilant. The traffic, thankfully, clears a bit as we approach Botswana. We cover over a hundred kilometers in about four hours, and though we have enough daylight to keep going across the border, there's a nice-looking rest camp on our side. We treat ourselves to one more night of camping in Namibia. Immigration form. Passport. Stamp. Pleasantries with the guard at the gate, photograph near the welcome sign. We enter another country, the second border crossing of our journey. Botswana is hot. It is dry. It is flat. We're struck immediately by the lack of fences. On either side of the road is the bush. It is dense and thorny and extends to the horizon. Animals wander in and out. Cattle, mostly. Cows, bulls, donkeys, horses. There is a high-speed road through arid, unforgiving lands. This is not the best habitat for a large mammal. The roadside is littered with carcasses in varying stages of decay. A horse's skeleton, picked clean. A pile of bones: skull, ribs, femurs. Husks of flesh and hair baked to leather under the unrelenting sun. A commotion of vultures swarming the roadside ahead; when they scatter, the smell of putrified meat, the smell of death. A horse of dwindling remains. Birds. Dead hornbills, dead owls. They're everywhere, as though they've just dropped out of the sky. Perhaps they have. Wings broken, feathers still rustling in the wind. Intact, not worth the vultures' time. 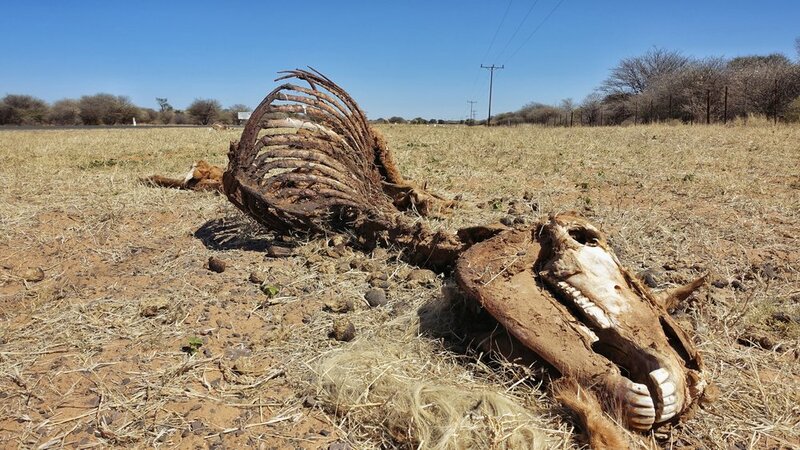 There are dead jackals, dead donkeys, dead lizards. The rusted steel of an old car, upturned and left to rot. The landscape speaks of desolation. Yet there's plenty living. Animals graze bravely in the shoulder, unmoved by cars and unyielding to a pair of cyclists like us. As we pass, they grunt and stomp and mock charge. We carve wide arcs around them. We mean no trouble. Because there are fewer fences on this side of the border, wild camping becomes much easier. In South Africa and Namibia, the choice was dichotomous: to camp in front of the fence or to camp over the fence. Here, we camp on a continuum. We camp based on distance: how far from the road we want to be, how far into the bush we want to go. On our first night in Botswana, we decide on just a few hundred meters. We set up our tent and leave the fly off and settle in. Later, a herd of cattle enters our clearing. From their perspective, it is probably their clearing. They don't seem pleased to see us, and a stocky bull with big horns approaches. He grunts. He comes closer to our tent than we'd prefer. Other bulls follow. We remain in the tent. We didn't quite expect cows to be the large mammal to worry about in Botswana, but there are plenty of them, and they're large, and they seem angry. I shout for them to keep it moving. The bull is just a few meters away. I clap loudly. We mean you no trouble. After a minute or two of uncomfortable stalemate, they move on. The bull turns away with a huff and the others follow, trudging through the brush for some better grazing. The trade winds of southern Africa move in an anticlockwise fashion. They race westbound across northern Botswana. They reach the mountains of Namibia and they turn south toward South Africa. For six weeks now, we have been moving in a clockwise fashion. We have had headwinds since the Cederberg. A northerly wind all the way north, an easterly wind now that we've turned east. 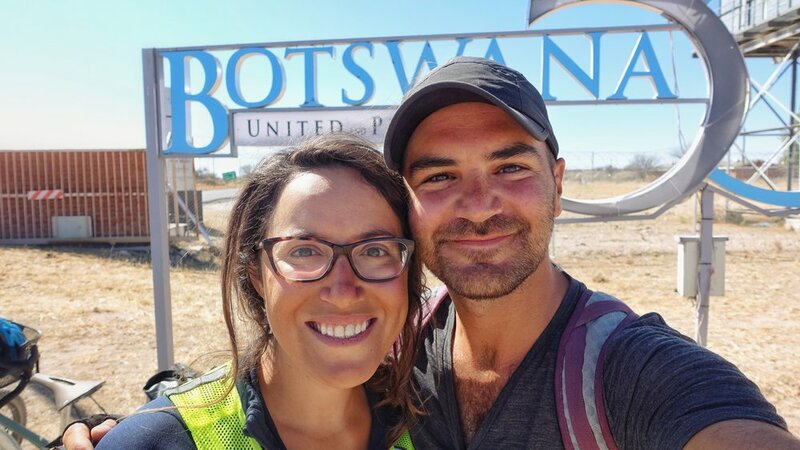 Our thirty-kilometer-per-hour ride to the border was a fluke; Botswana is windy and they are not the kind of winds we want. Our progress is good, albeit more effort than we'd like. We reach Ghanzi after a few long days of battling these winds. We find a hotel with rooms well out of our budget but a spot to camp that's just inside our budget. It comes with full access to the pretty, green grounds, and we spend the next two days sitting in the shade of thatched roofs and palm fronds at the edge of a crisp blue pool. We carry on, and the road to Maun is more of the same. More headwinds. More straight, flat tar. More aggressive donkeys, aggressive horses, aggressive cattle. More late-night turf wars with pointy-horned bulls coming quite near the mesh walls of our little tent. More heat and flies and sun-bleached skeletons piled on the roadside. More sweaty afternoons spent eagerly awaiting the onset of cool desert nights. We ride through the village of Sehithwa. There is a petrol station at its northern end where we hope to refill our bottles and maybe pick up a few snacks. But like many places in Botswana, we seem to have arrived a few months too early. The convenience store has been built, and refrigerators, counters, and shelving installed, but stock has not yet come. We settle for just some water from the tap. Outside are three employees sitting around waiting for the occasional car in need of gas to pull up. They ask about where we've been and where we're headed. They ask how long we've been biking for. And then they ask, "Is that cyclist with you too?" I'm confused. What cyclist? I spin around and there he is, pedaling toward us on a dusty, heavily loaded bike. He's the first bike traveler we've seen on this trip. He dismounts and we all greet each other with a familiarity reserved for close friends. We are part of a small, strange tribe, us wandering cyclists, and the camaraderie is immediate. His name is Boone. He's from Korea. He began traveling the world on his bicycle two years ago. The current leg of his trip began in Cairo, many thousands of kilometers north of here. His past is, in many ways, our future; he is coming from the very places which we are headed. We do what passing cyclists do after saying hello and eyeing each others' bikes and swapping contact information. We pepper Boone with questions about the road ahead. Are there elephants? Many. Do things get cheaper? Eventually. Will the winds ever turn around? Maybe in Malawi. The sun beats down on us, and Boone is thirsting for an ice cold Coke. The three of us spend a few moments collectively savoring the imagined flavor of a carbonated soft drink pulled straight from a refrigerator. We regret to inform Boone that there are no Cokes to be found in the barren little shop we're standing in front of. We tell him he may have better luck on the other end of town. We say our goodbyes and Boone rides off. We go about buckling our straps and donning our helmets and pushing our bikes through the sand back onto the main road. Suddenly there is Boone, rushing toward us with a pair of ice cold Cokes. He's found them in the cooler of a tiny kiosk run by a Sehithwan villager. And though he's moving on just as tight a budget as we are, probably less, he's kind enough to treat us to the most refreshing, coldest drink we've had in days. We don't want to slow down his westward progress, so after thanking him profusely, we turn left into the brutal headwinds as he sails in the other direction, pushed along by those same gusts. A few kilometers outside of town, we enjoy our Cokes under a big leafy tree. And then, rejuvenated in body and in spirit, we continue east to Maun.